Photo provided by the City of Lynchburg, Virginia April 30, 2014. This time it’s Lynchburg, Virginia. Don’t know where the train originated, what type of oil, but there is indeed a trend! 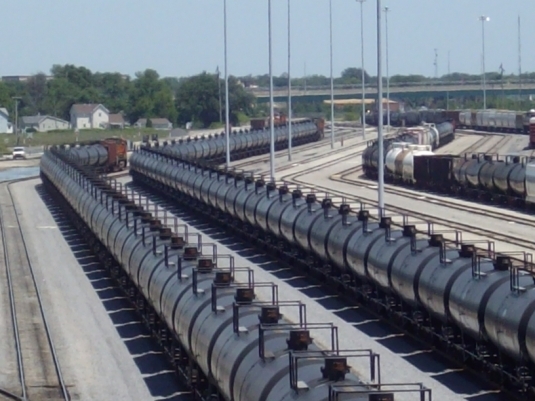 Bakken BOOM crude oil MUST be DEGASIFIED before it is shipped, shipped by rail, shipped by pipeline, it must be DEGASIFIED before it goes anywhere, because the high gas content is what makes it dangerous. DEGASIFY now. How many more towns must burn before they DEGASIFY? LYNCHBURG, Va. — Several CSX train cars carrying crude oil derailed and caught fire Wednesday along the James River in Lynchburg, Va., with three black tankers ending up in the water and leaking some oil, becoming the most recent crash involving oil trains that has safety efforts pushing for better oversight. Nearby buildings were evacuated for a time, but officials said there were no injuries and the city on its website and Twitter said firefighters on the scene made the decision to let the fire burn out. 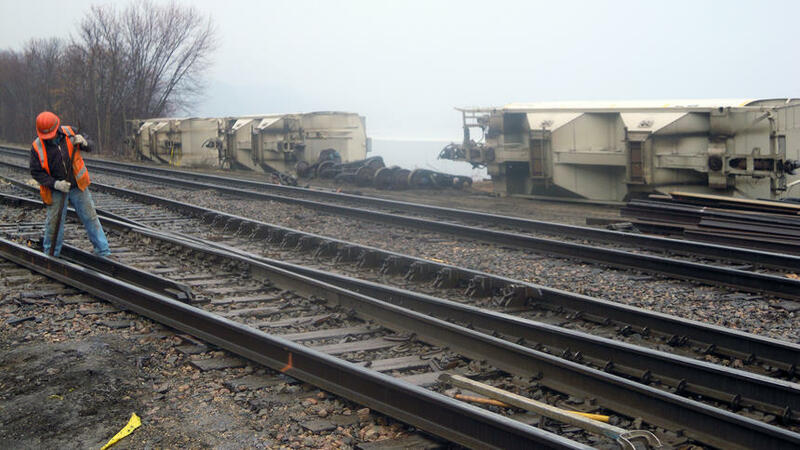 Three or four of the tankers were breached on the 15-car train that CSX said was on its way from Chicago to unspecified destination. Most of the cars were knocked off the tracks. Photos and videos posted online showed large flames and thick, black smoke right after the crash. But in later photos it seemed the fire was mostly out. Well, that’s not quite right. This “rulemaking” has yet to get ON track, and that’s what’s bothering me. Once more with feeling… you’ve got to have a DRAFT to COMMENT ON! The panel first met on January 29. The way I view then, the next step, what we’re doing internally in the PCA, is that in the summer, we’ll present, the agencies will present some conceptual overviews of rule concepts, and I am adamant, that’s going to look a lot like this, that it’s going to say something like, what’s there, what do we think we want to do, if it’s Air Emissions, OK, we think Best Management Practices, monitoring, something else, what do we think those will consist of, and present that to you for your feedback, so that you really have a sense of what do we think is important, where do we see this rule going, and can respond to that and give us that feedback. Charlie and I were talking about this a little bit in the car, sort of to give you that concept before we get into that, what do all the little details of the words have to say, because then I think you can understand where we think we’re going, give us some feedback on that, and then when we start to write the language, if it doesn’t operationalize the concepts that we talked about, you can say, that is not what you said you were going to do, we read this as something completely different. The way I view this going foward, in the summer, we’ll present some of those conceptual overviews, various agencies will do that, then at the end of the summer, Will and I have been talking about it, we’ll use an EQB meeting, as sort of a public review of those conceptual overviews from all of the agencies and the where the public can have more input as well, and then in the fall, if the agencies would make presentations with some more defined rule proposals, and how defined they is going to vary by agencies, but probably some real concrete rule language and SONAR. So that’s how we view it moving forward, and if something is a really big concern to you guys, obviously we can adjust. Your advice and your input is very, very valuable to us… It’s advice and input… We don’t expect a written product, we don’t expect that this is a voting process. We’ll be listening for consensus, for what we hear… that you’re all on the same page and you agree, that some people are kind of reserved about it it but you can live with it… we’re not going to be doing voting…. Our goal is that the rules that result from this process is that we’ll have rules everyone can live with. That’s really what we’ve found with this stakeholder process. 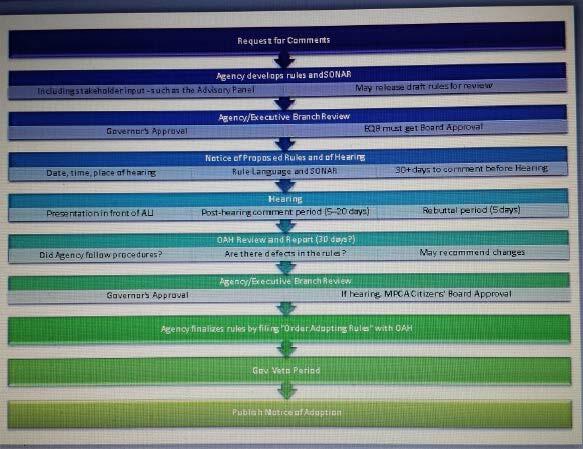 So what I’m getting out of this is that this summer, “concepts” will be brought to the committee for feedback, and that maybe, MAYBE, they might get some draft rules before the agencies present it with the SONAR for comment. Most I’ve heard is that they “hope” to have some draft language. The law was passed what, last May? These meetings started in January, and September is 9 months from January. It shouldn’t take that long. Bottom line, I think this is a “make work” thing for avoiding producing the draft rules for review. First, the Supremes — which upholds the EPA’s regulations governing air pollution emitted in one state and causing harm in another (ND v. MN anyone??). …there is less than one questionable vote cast each major election per 330,000 eligible voters. The rate of potential voter-impersonation fraud is thus exceedingly tiny. Voter ID – Judge Adelman’s Order: Frank, et al., v. Scott Walker; and League of United Latin American Citizens of Wisconsin, et al. v JUDGE DAVID G. DEININGER, et al. In yesterday’s New York Times, Paul Krugman says very clearly what I’ve been trying to wrap my head around. 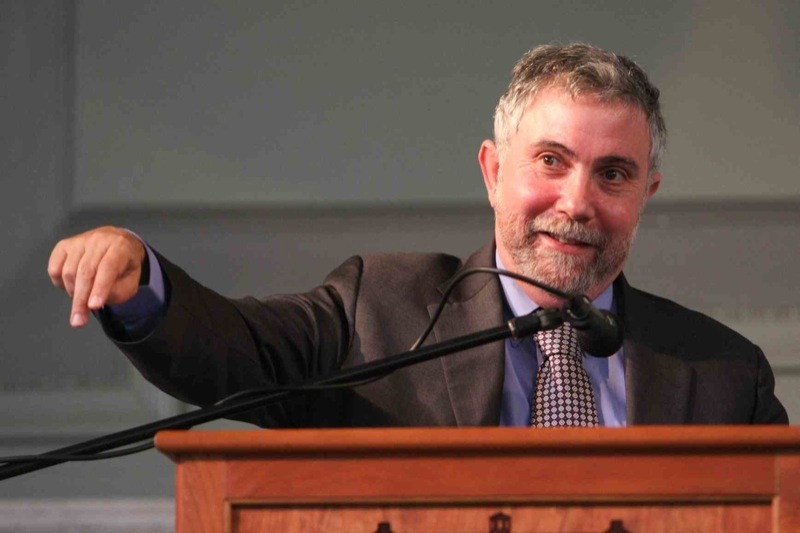 Cliven Bundy is a moocher, no doubt, I’ve called him a “welfare queen” too, but the hatred Bundy spews is… is… well, read what Krugman has to say, he puts it all together. The anti-government mindset is indeed a problem. Just Friday, I ran into it when a friend repeated the mantra, “You know what’s wrong, it’s the government, the government is too powerful,” when we were attending a hearing focused on utility power (“why do you think they call them power companies”), where it was a utility trying to take someone’s land. HUH? How is that an example of problem with “government?” The landowner in the middle of the fray clearly stated her take, “It’s the utilities, the corporations have too much power.” Yup, my take too. How does it become an issue of “too much government?” This highlights the failure of our individuals and schools to foster critical thinking compounded by the acceptance of the non-stop media regurgitation of false and twisted information. But hey, that’s just another display of corporate power. For at the heart of the standoff was a perversion of the concept of freedom, which for too much of the right has come to mean the freedom of the wealthy to do whatever they want, without regard to the consequences for others. 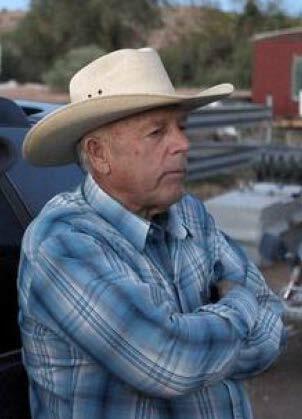 It is, in a way, too bad that Cliven Bundy — the rancher who became a right-wing hero after refusing to pay fees for grazing his animals on federal land, and bringing in armed men to support his defiance — has turned out to be a crude racist. Why? Because his ranting has given conservatives an easy out, a way to dissociate themselves from his actions without facing up to the terrible wrong turn their movement has taken. Start with the narrow issue of land use. For historical reasons, the federal government owns a lot of land in the West; some of that land is open to ranching, mining and so on. Like any landowner, the Bureau of Land Management charges fees for the use of its property. The only difference from private ownership is that by all accounts the government charges too little — that is, it doesn’t collect as much money as it could, and in many cases doesn’t even charge enough to cover the costs that these private activities impose. In effect, the government is using its ownership of land to subsidize ranchers and mining companies at taxpayers’ expense. It’s true that some of the people profiting from implicit taxpayer subsidies manage, all the same, to convince themselves and others that they are rugged individualists. But they’re actually welfare queens of the purple sage. And this in turn means that treating Mr. Bundy as some kind of libertarian hero is, not to put too fine a point on it, crazy. Suppose he had been grazing his cattle on land belonging to one of his neighbors, and had refused to pay for the privilege. That would clearly have been theft — and brandishing guns when someone tried to stop the theft would have turned it into armed robbery. The fact that in this case the public owns the land shouldn’t make any difference. Citizens Acting for Rail Safety (CARS) held a meeting last night in La Crosse, WI, to discuss the proposal to build a second rail line in the middle of La Crosse. It was packed, over 300 people, standing room only. The comments of those attending shows the level of concern over The rail company, BNSF, claims a second line is necessary due to increased traffic. We’ve seen the increase, I’ve experienced it here in Red Wing, watching the trains rumble through the heart of town. Well, folks, it’s time for us to rumble!